Luv Rokambo is the Japanese sound art duo of Toru Yoneyama and Osamu Kato. The CD was recorded during August of 2001 in Tokyo and reviews on the Public Eyesore page indicate this is their second release. The music consists of experimental collages of guitar, electronics, percussion, and various sound and voice manipulations, the vocals being delivered in a moaning, whining style. 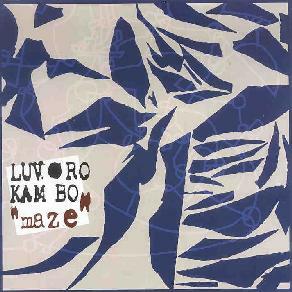 Luv Rokambo can be mellow at times, playing sparse guitarscapes that focus on texture and the feel of individual notes. But they can also be harsh and intense. The album is a bit hit and miss, with some pieces being good examples of the possibilities of experimental sound art, and others being less than interesting and even careless in their execution. Among the tracks I enjoyed was "The Waste Land". The voice is somber, perhaps even anguished, but still somehow melodic. We're in experimental realms, but they are psychedelic ones with space guitar that straddles the border between Shoegaze and angst. On the more aggressive side is "Delayhead". The track begins with brain shattering noise-scapes which soon begin a give-and-take duel with the guitar and electronics. The guitar is more creative and fluid on this piece than others, making for interesting and considered variety. And for pure mind madness, "Maze" features sustained brain piercing tones combined with cosmic feedback and various other patterns that make for a cool Hendrix meets Heino freakout. Overall the album includes lots of good ideas and some very enjoyable moments, though Luv Rokambo don't consistently succeed. For example, some of the guitar on "Only Shadow/Without Human (III)", though focusing on somewhat minimalist patterns, has a rock guitar soloing feel (quite unintended I'm sure), which doesn't come off very well. I think it's this tendency toward aimless noodling that provides the albums weak moments. At the same time there are pieces that may not work completely, but are certainly interesting. In particular, "3" consists of moaning guitar and rapidly pulsating guitar textures combined with almost jazz styled drumming which took me a bit by surprise. Definitely enough good stuff to make this a worthwhile listen.